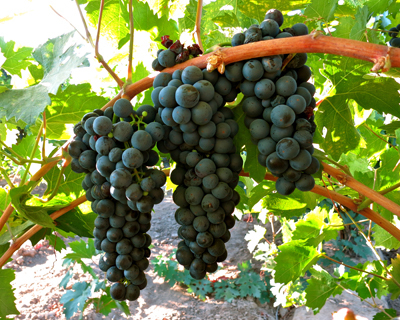 Primitivo (also known as Zinfandel) is a variety of black-skinned wine grape. The variety is planted in over 10 percent of California vineyards. DNA fingerprinting revealed that it is genetically equivalent to the Primitivo variety traditionally grown in Puglia (the “heel” of Italy), where it was introduced in the 18th century, as well as to the Croatian grapes Crljenak Kaštelanski and Tribidrag. The grape found its way to the United States in the mid-19th century, and became known by variations of the name “Zinfandel”, a name of uncertain origin. The grapes typically produce a robust red wine, although a semi-sweet rosé (blush-style) wine called White Zinfandel has six times the sales of the red wine in the United States. The grape’s high sugar content can be fermented into levels of alcohol exceeding 15 percent. The taste of the red wine depends on the ripeness of the grapes from which it is made. Red berry fruit flavors like raspberry predominate in wines from cooler areas,whereas blackberry, anise and pepper notes are more common in wines made in warmer areas and in wines made from the earlier-ripening Primitivo clone. Primitivo translates roughly as “early one”, and it is hard to miss the link here with Tempranillo, which means the same thing in Spanish. English speakers might infer the grape was in some way “primitive”, perhaps less refined than other grape varieties and the robust, almost aggressive character of much Primitivo might support this idea – even in Puglia the wine is known as Mirr Test, meaning “hard wine”. However, the Primitivo name is thought to be a reference to the variety’s early-ripening nature, although it is also possible that it was named in reference to the uneven way Primitivo berries ripen; it is not unusual to see plump, fully ripened berries clustered alongside hard, green “grapeshot”. A classic Primitivo wine is high in both alcohol and tannins, intensely flavored and deeply colored. In Manduria, the fortified liquoroso variants often reach an ABV of 18 percent, which is dulled to 14 percent in table wines. A certain bitterness is often found in Primitivo which, combined with its mouth-puckering tannins, means that it needs a few years in either bottle or barrel. This faint bitterness is a trait that characterizes many Italian wines, and a quality that is being used to mark Primitivo as a truly Italian grape, quite distinct from its alter ego across the Atlantic.